The old joke about fusion is that it is 30 years from becoming a reality — and that’s been the case for the last 50 years or more. It’s a joke that may quickly be reaching its sell-by date. And a good thing too. The promise of fusion is near-unlimited energy that produces almost no waste. Traditional nuclear reactors split atoms to create energy. These fission reactors run on processed uranium and leave behind radioactive waste. Fusion, on the other hand, is the same process that keeps the sun shining. Fusion reactors would run on abundant hydrogen isotopes and, in theory, create significantly more energy than fission with comparatively little waste. Fusion might provide the perfect complement to renewable energy in the future — but building fusion reactors has proven a tough nut to crack. In early 2016, however, two major fusion advances were announced. First, the German Wendelstein 7-X stellarator reactor reached plasma temperatures of 80 million degrees. Just a week later, the Chinese Experimental Advanced Superconducting Tokamak reactor controlled plasma for 102 seconds. One major challenge for fusion energy is reaching high enough plasma temperatures. 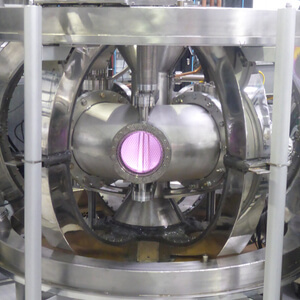 Another is maintaining stability of the plasma, which is essential to most fusion reaction processes. The two projects show how scientists are closing in on solutions that can help conquer these hurdles. At the same time, technical progress is speeding up in a multitude of different fusion reactor approaches. And parts of the fusion industry itself are beginning to resemble the startup ecosystem known from the information technology industry. The most well-known kind of fusion reactor is the donut-shaped tokamak that uses electromagnets to control the fusion. The best-known tokamak is the ITER reactor, some of whose electromagnets weigh roughly the same as a Boeing 747. Grossly oversimplifying, the general idea behind ITER is that bigger means better control. It is designed to make 50 megawatts input into 500 megawatts output — enough to power a small city. The project is based on extensive physics and engineering research, making it very likely that it will work. However, several other tokamak designs are heading in the opposite direction — they’re going smaller. Tokamak Energy’s more compact tokamak fusion reactor. Image Credit: Tokamak Energy. One is the so-called ARC reactor out of MIT. Using mathematical formulas it is possible to calculate the energy needs and physical layout to make a fusion reactor function at different sizes. This makes it possible for MIT to build a much smaller reactor. The result? More compact reactor designs that are cheaper and smaller than ITER-like tokamaks while delivering the same power output. 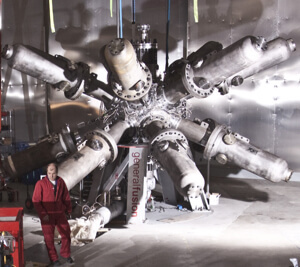 Tokamak Energy is also working on a scaled down version of a tokamak reactor. A big advantage to going small is that the number of areas in which a reactor can be used increases. Stellarator reactors look a bit like a donut designed by M.C. Escher. “A stellarator is designed like a twisted tokamak, with each ring that comprises the structure of the tokamak contorted in a very precise way according to complex mathematical calculations. The practical advantage of this is that while tokamaks can only work in short bursts, a stellarator could, in theory, run continuously,” Sutherland explains. Apart from the Wendelstein 7-X, other stellarators are also making headlines. One is the QUASAR reactor, a so-called ‘quasi-axisymmetric stellarator’. The QUASAR design aims to provide a more compact and economical model for stellarators. Other advantages include the fact that the design does not require any externally driven plasma currents and is intrinsically steady-state, meaning that maintaining the fusion reaction over time becomes much easier. There are also advances in MTF reactors. This kind of reactor works by confining and pre-heating fusion fuel into plasma. It is then squeezed together, which massively increases its temperature. A key advantage to the MTF approach is that it is also a practical solution using established industrial technology. General Fusion is one of the companies pursuing MTF. “Our design uses a spherical tank filled with liquid metal, surrounded by pistons. The liquid metal is pumped to form a vortex, and the fusion fuel is injected into this cavity as a plasma. The pistons then compress the liquid, driving the temperature of the plasma up exponentially initiating a fusion reaction. This fusion reaction heats the liquid metal and a heat exchanger turns that heat into steam and electricity,” Nathan Gilland, CEO of General Fusion explains. The company has received funding from a string of VCs, as well as Amazon’s Jeff Bezos. The influx of capital from VCs and tech entrepreneurs to fusion companies is a relatively new development. It is one of two factors that is helping democratize the fusion industry. “Fusion used to be the remit of national governments and international organizations. That is no longer the case. An ecosystem of startups is developing, and that is helping to speed up the progress towards fusion,” Kingham says. At the same time, accelerating advances in computers, AI, big data analytics and material science are lowering development costs and opening up new possibilities for companies. The result is a great diversification of research, greater competition and generally greater development speed. “The technological advances mean that fusion’s progress is running parallel with Moore’s law, and we’ve seen exponential improvements over the last 30 years,” Gilland says. Will fusion’s latest wave prove successful? There are no guarantees. Even though the advances are speeding up, major challenges still exist in fusion power. This has been illustrated by ITER, which is delayed and not likely to be ready for tests before around 2025. The delays mean that other projects, including those of General Fusion, CTFusion and Tokamak energy, are still very much in the race to be the first to deliver fusion power to the grid. With current development speeds, at least one of them may reach that goal by 2030. To get to there, researchers still need to overcome a number of hurdles. Initiating the fusion reaction is still a central challenge. Whether it’s wrangling a complex magnetic field or figuring out how to generate enough force to compress the fuel and initiate a reaction, getting strong enough and fine enough control of confinement is anything but easy. Many fusion research reactors are closing in on energy equality, where the amount of energy coming out of the fusion reaction is equal to the amount being used to run it. However, that is very different from converting that energy into a form that can be used to drive electricity production. As with fission, energy from a fusion reaction needs to be converted into a form that can produce electricity. This is usually done through heat exchange that creates steam, which in turn drives a reactor. Finding efficient ways of converting fusion energy to electricity are essential for the technology’s long-term success. The stability of fusion reactions is also a major issue, as is the lifetime of reactor parts. A fusion reaction generates a lot of loose high-energy particles that smash into and wear out the complex machinery. However, fusion’s vast potential will likely lure more companies into the race in the coming years. “Fusion introduces the possibility of a much more peaceful, cleaner world that has a nearly unlimited fuel source that is not geo-locked to particular countries. Also, with such an advanced energy source, we can start entertaining the idea of traveling to other planets and solar systems, setting up colonies there, and start to spread out to ensure long-term survival of our species,” Sutherland says.